RIDGELY, Md. 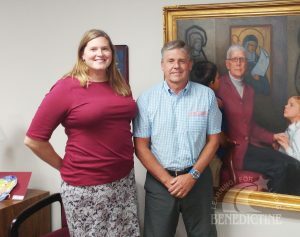 – Benedictine, an organization that cares for more than 200 children and adults with developmental disabilities, announced the appointments of Duane E. Zentgraf and Theresa Bradley to its board of directors. Mr. Zentgraf, president and CEO of U.S. Utility Corporation, has been involved in and owned various residential land development and commercial projects in Maryland and Delaware since 1986. In addition to his professional experience in property management Mr. Zentgraf has held his real estate license since 1986 as well as his private helicopter pilot license since 1988. With the support of his wife of 32 years and three children, Mr. Zentgraf joins the Benedictine Board of Directors. Additionally, Theresa Bradley, director at the PricewaterhouseCoopers Baltimore Assurance practice joins the Board. Bradley is a demonstrated leader in planning, directing and evaluating complex technology compliance audits, specializing in financial services. She serves as the process and controls advisor to various clients during annual compliance evaluations, implementations, mergers, upgrades, and third party service provider evaluations. In her personal time, she is devoted to her community, focusing on women and youth. Benedictine’s board of directors oversees the organization’s mission and planning, and supports the executive director in managing resources, monitoring programs and services, and ensuring legal and ethical accountability. All members of the board are volunteers with valuable expertise in educational, legal, political, corporate, and other arenas. Providing opportunity to live meaningful, productive lives in communities of choice, Benedictine helps children and adults with developmental disabilities reach their greatest potential. For more information please call 410-634-2112 or visit online at www.benschool.org.